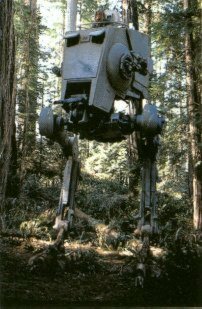 I'm sure Star Wars fans recall the two-legged walkers like the one pictured below. This two-legged robot has been brought to life - in a much shorter version - by Agility Robotics. It is loosely modeled on the cassowary, a flightless bird similar to an ostrich. Legs with backward-facing knees attach to a short torso that holds batteries, motors and a pair of computers. U-M is receiving the first unit.